Create, Alter, and drop the tables and views. Recreating (drop and create) the dimension, and fact tables before loading the data into them. Save the result set in a variable so that we can use that data in other tasks. 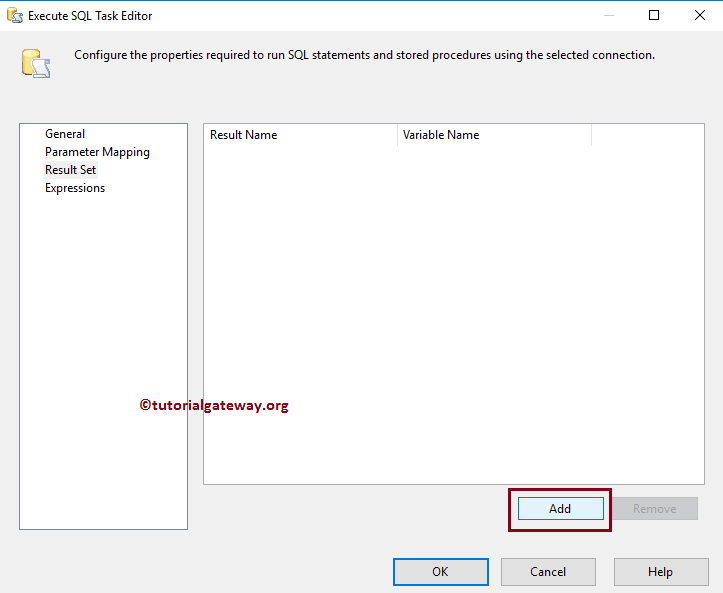 Double click on it will open the SSIS Execute SQL Task Editor to configure it. 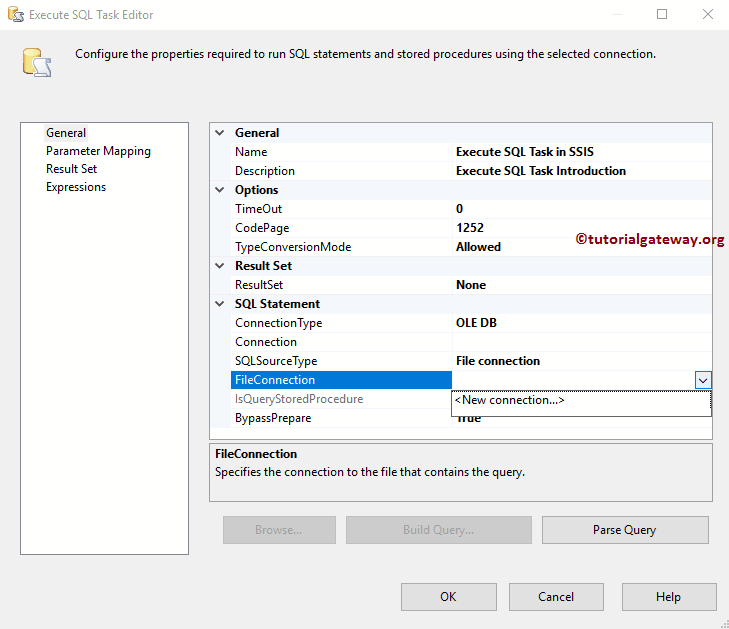 This tab is used to configure the SSIS Execute SQL Task properties. Description: Briefly describe the SQL Task Functionality. It is always a good practice to provide the valid description. In real-time, please change the Task name to appropriate name, and write the description to explain the task functionality. Because it will help other developers to understand the task better. TimeOut (in seconds): Please specify the connection timeout in seconds. If the connection takes more than that time, then the connection will fail. By default, it is 0, and it means infinity seconds. CodePage: Please specify the code page that the task wants to use while converting the Unicode values in variables. By default, it will use the local computer code page. 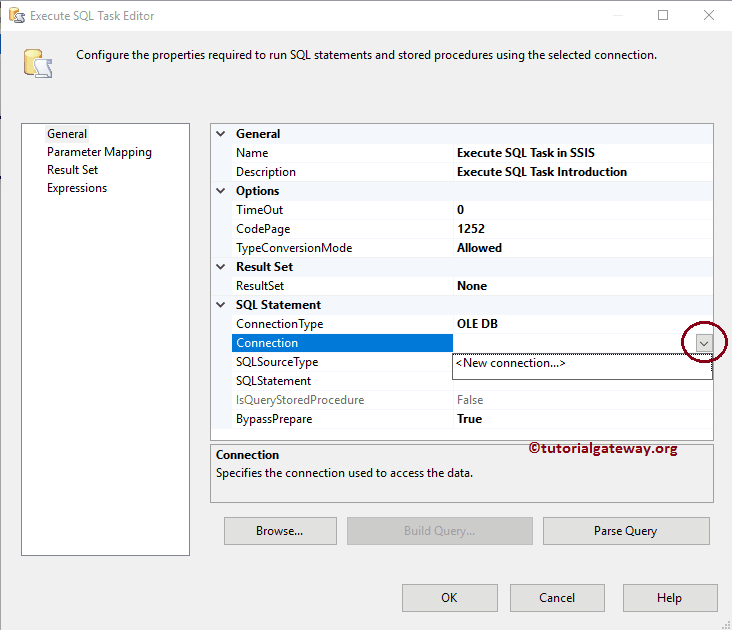 Configure the Connection Manager settings for the SQL Statement. If you already created the Connection, then select from the list or else click <New connection…> to create a New Connection. Please specify, How you want to provide your source data. 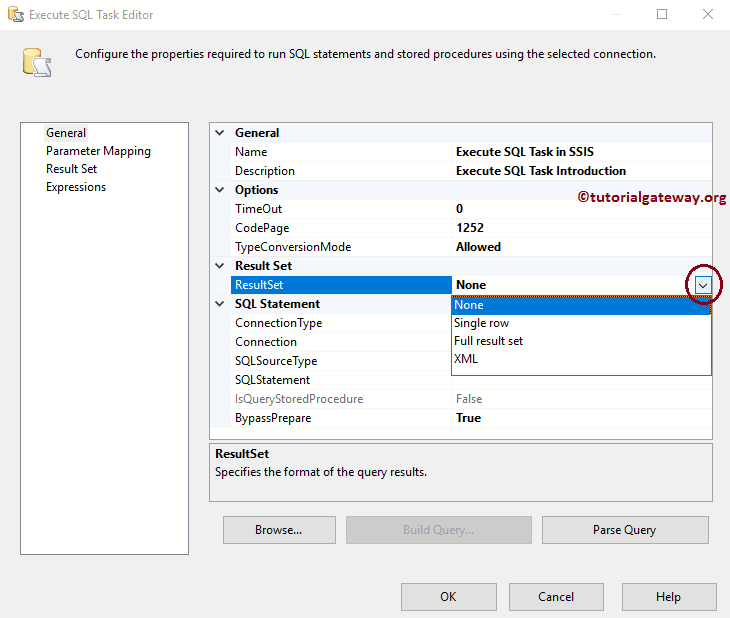 This SSIS Execute SQL Task provides three options. 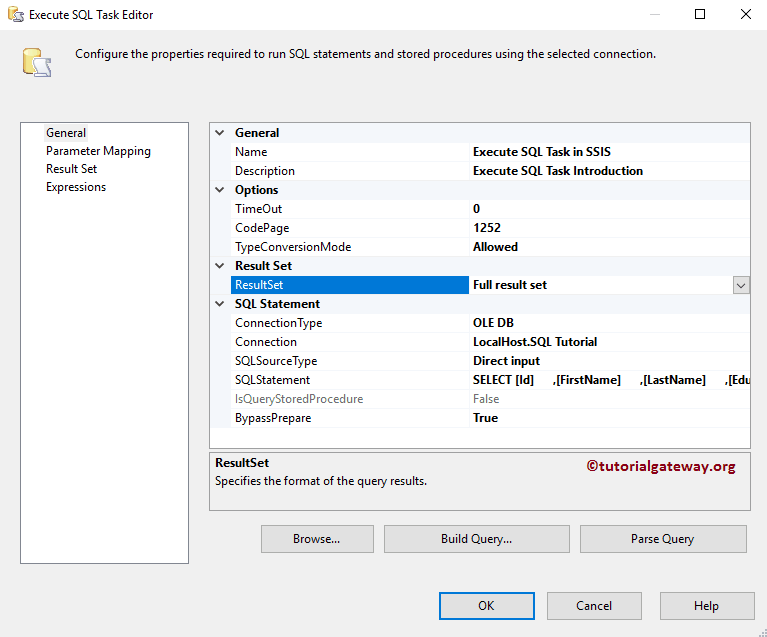 Direct Input: If you want to write an SQL Statement directly, then select this option. 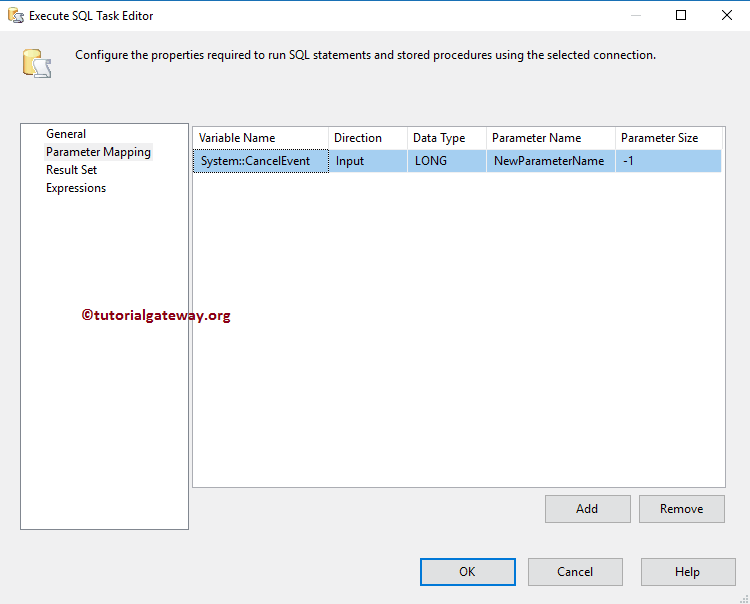 Variable: If your query is in a variable then please select this option. Next property is completely based on the SQL Source Type option. For example, if we select the File system as the source type, the next property will be changed to File Connection. And we can use this property to locate the select the file. 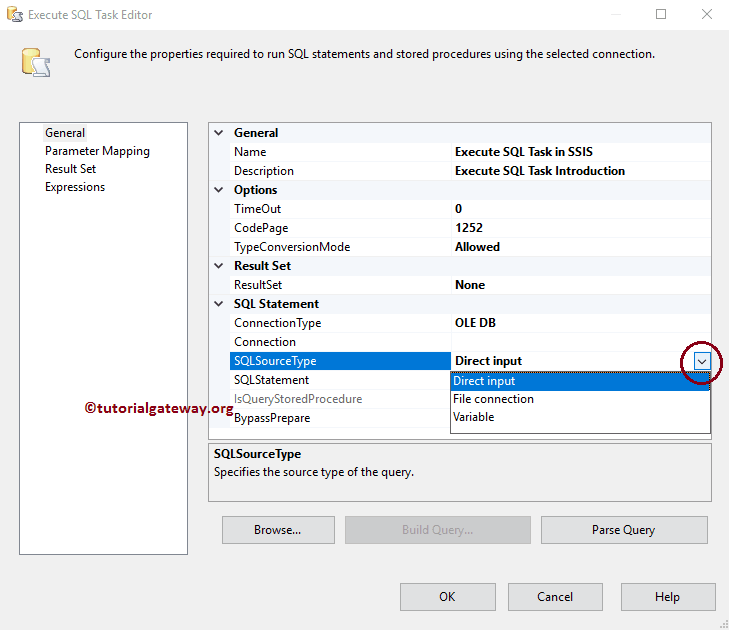 For example, if we select the Direct input as the source type, the next property will be changed to SQL Statement. And we can use this property to write our own SQL statement. To demonstrate, we are writing the following query. If you selected the Connection type as ADO or ADO.NET then only the property value is enabled. If your query is a stored procedure then change the property value to True. None: If you don’t want to return anything back then you can select this option. 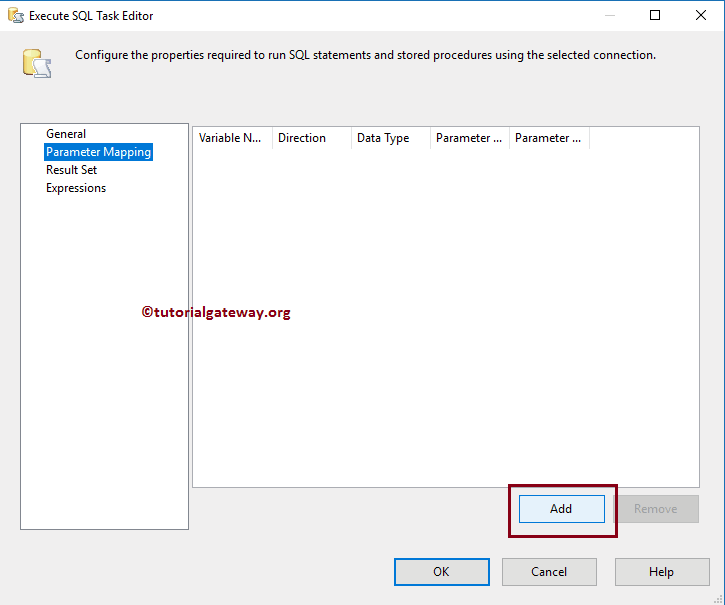 For example, you are using the Execute SQL Task to truncate the table then there is no point in returning any value. Single Row: If you want to return a single row as the result set then you can use this option. For example, the total number of records in a table, or columns etc. Full Result Set: If you want to return more than single row as the result set, then you can use this option. XML: If you want to return XML file as the result set then you can use this option. You have to use this Parameter mapping tab to map the parameters that we specified in our query. If you don’t have any parameters in your query then quit this section. 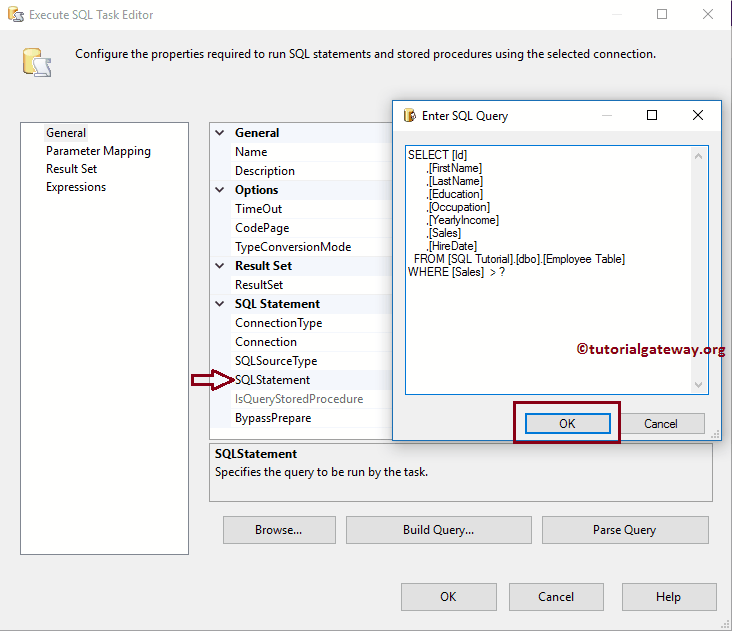 If you observe the above SQL statement we specified the query as Sales > ?. It means we have to pass the value (or variable) to that question mark. So, Please click on the Add button to add the result set name. Once you click on the Add button, it will enable to map the variable to the parameter. You have to use this Result Set tab to map the result that we are getting from our query. Remember, if you specified the Result set property as None then this tab is disabled. Please click on the Add button to add the result set name. Result Name: Please specify the valid name that you want to assign for the result set. I suggest you use the meaningful name because we will use this name in a subsequent task that is a connection to this execute SQL task. Variable Name: This property displays the list of available user variables (if any), Please select the appropriate variable. If you haven’t created any variable before then please click on the <New Variable..> as shown in the below screenshot. It is used to write the expressions.